And that answer is both correct and biblically supported. Many Bible passages discuss God’s unchanging nature. But, just as we begin to get truly comfortable with the concept that God has not, does not, and will not change, we find this word became. In the beginning was the Word, and the Word was with God, and the Word was God…and the Word became flesh and dwelt among us… (John 1:1 & 14). The word became denotes change. Not minor change, but fundamental change. He didn’t temporarily disguise Himself as human…He became human. God was not a man…but He became a man. 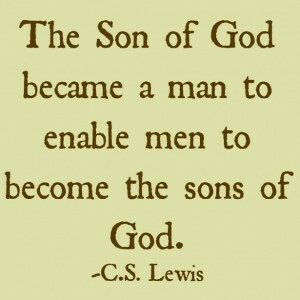 God was not a son of man…but He became a son of man. In fact, Jesus often referred to Himself as the son of man. God became! He changed…God became something He previously was not. Almighty, perfect, unchanging creator God became a created being. God did not change His nature. Jesus still does not lie, nor need to repent. Although, as the Son of Man, Jesus did receive the baptism of repentance. In becoming human, God did not lower the standard of deity…rather, He raised the standard and condition of humanity. For us, God changed who He is. His identity is forever changed. God became one of us…human. Jesus will forever be human. Jesus will forever bear the nail scars of His covenant with us…scars that were not there before, but now are…for us! God was already perfect. He had no need to change…no need to be perfected…no need to become anything other than who He already was. But we needed a redeemer…a deliverer…a savior. He was already perfect deity. He became our perfect savior. This entry was posted in God's Position toward Us, love, Redemption and tagged advent, christ, Christmas, Jesus, jesus christ, unchanging, unchanging God, word became flesh by joe. Bookmark the permalink.